You can email us at info@discofinechem.com, or call us on 01202 539791.Email: info@discofinechem.com. Phone: 01202 539791. Discovery Fine Chemicals / Products / Bafilomycin B1 from Streptomyces sp. Bafilomycin B1 from Streptomyces sp. Bafilomycin B1 is a toxic macrolide antibiotic used to study cell processes such as autophagy, pH control within cells, and mechanisms of apoptosis. 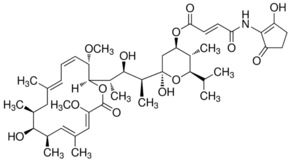 Send us your enquiry for Bafilomycin B1 from Streptomyces sp.. We offer custom pack sizes at special prices. We aim to respond to your enquiry within 24 hours. We value your input so if you have suggestions regarding new applications for Bafilomycin B1 from Streptomyces sp. email us and we will include your contribution on the website. You can search for a product by its name, or its CAS number. Copyright © 2016. Discovery Fine Chemicals.